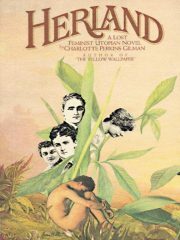 Charlotte Perkins Gilman’s 1915’s feminist utopia Herland is the middle volume of a trilogy, being preceded by Moving the Mountain and followed by With Her in Ourland. I had not previously read this book and didn’t know what to expect. Well, given the time when it was written, I did expect some form of genteel racism, perhaps coupled with eugenics, and I wasn’t wrong. But there’s more here than that.